Drew Woodke has won the RunGood Poker Series Council Bluffs Main Event for $25,197. It was a great week of action in Iowa with Omaha, Nebraska, native Drew Woodke (lead photo) claiming the $575 RGPS Horseshoe Council Bluffs Main Event title after a five-way chop at the final table. "I'm probably just going to put it in the bank in savings. I've got a family and two young kids at home." 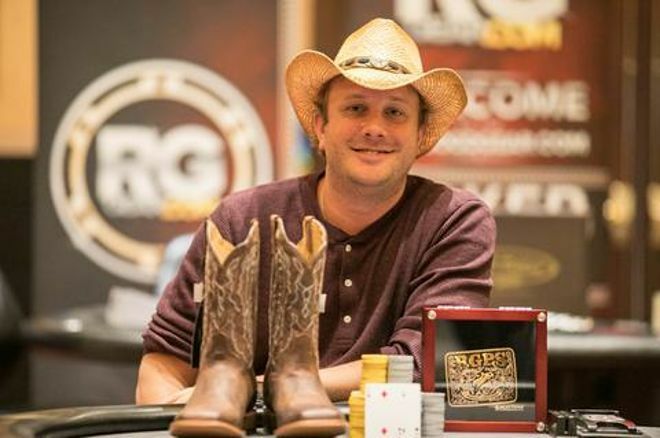 Woodke, who works as a real estate agent, took home $25,197 for his efforts along with a pair of custom-made boots and the RGS Championship Belt Buckle. "It feels good," he said after taking his winner's photo, noting that he didn't have any real plans for the cash. "I'm probably just going to put it in the bank in savings. I've got a family and two young kids at home." The win moves Woodke's career tournament winnings to almost $158,000, and this is his first win on the RunGood Poker Series. Finishing second was Charles Reed, who takes home $24,063 for his efforts. The event attracted 330 entries and topped the $100,000 guaranteed prize pool by an extra $68,300. The Main Event kicked off on Friday with the first of three starting flights, and Woodke was crowned the winner on Sunday. The next stop on the Old West RunGood Poker Series is at the Hard Rock Hotel and Casino in Tulsa, Oklahoma.